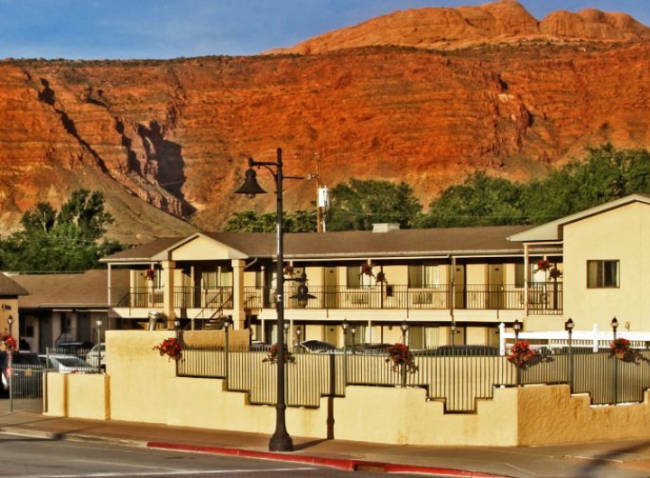 Located on Main Street in Moab, Utah with Arches and Canyonlands in its backyard, Bowen Motel is the perfect accommodation for travelers seeking adventure and affordability. This quaint, Moab establishment is within walking distance to most dining, shopping, bicycle, and raft rentals and offers spacious, affordable rooms ranging from standard rooms to family suites. Relax in the outdoor heated pool after a day of adventuring in the park or utilize the motel's bicycle wash area to gear up for another day in the parks. Bowen Motel strives to provide excellent service at fair prices so you can spend your time enjoying your trip in beautiful southern Utah where opportunities for activities are endless. The Deluxe Rooms come with either one king or two queen beds with standard room amenities and 330 square feet of space. For the budget conscious traveler, these smaller one queen rooms offer standard room amenities and 209 square feet of space. The Family Rooms comfortably sleep up to six people with two queen beds and one double bed. They come with standard room amenities and offer 385 square feet of space. Cancel by 4:00 PM local hotel time at least 24 hours prior to arrival to avoid a 1 night(s) cancel penalty charge. Rates Policy: Rates are based on double occupancy. Rates are subject to change or increase depending on availability and season. Each additional guest age 12 or over is an additional $10.00 per night.